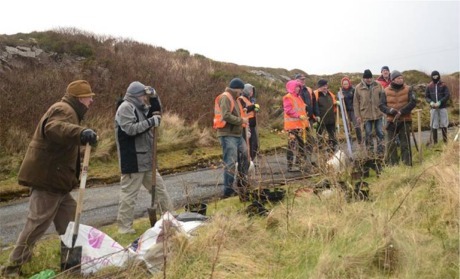 VOLUNTEERS braved the cold weather to plant 100 native saplings and shrubs at Fort Dunree on Saturday. 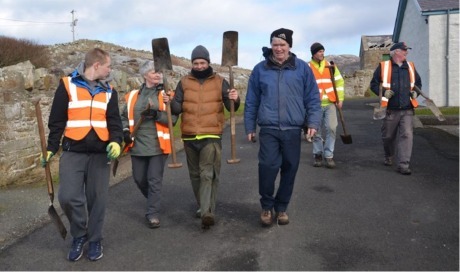 Wild Inishowen organised the event as part of National Tree Week with the aim of helping wildlife and the local environment in the face of increasing storms and flooding. The Wild Inishowen committee thanked everyone who turned out including members of Buncrana Tidy Towns and other local volunteers. Don't forget your shovel...volunteers assemble at Fort Dunree to plant 100 trees. They also thanked the boys and girls of Desertegney National School who also took part. "A very special word of thanks goes to club member Colm Grant who organised the whole event with the help of George McDermott . Colm kindly donated all the trees himself, his generosity was second to none. Thanks goes also to David Magee, Fort Dunree," Wild Inishowen said in a Facebook post. Volunteers hard at work planting 100 trees at Fort Dunree as part of National Tree Week. For more photos see Wild Inishowen's Facebook page.